Where did the whales go this winter? As was reported in the previous newsletter, this whale watching season was greatly affected by the El Niño phenomenon, which caused whale abundance to decrease dramatically. 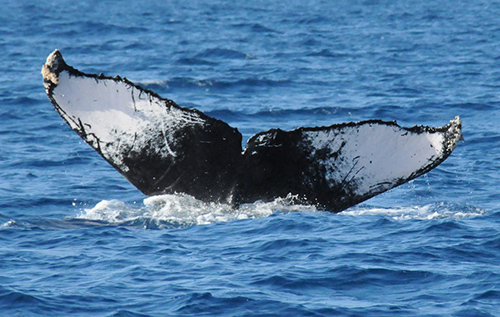 This was not only felt in the Bay of Banderas region, but in all the areas where the North Pacific humpback whales usually arrive each winter to reproduce, such as Los Cabos, the Revillagigedos islands, all areas of the Pacific coast of mainland Mexico, and even in Hawaii a lower abundance of humpbacks whales was observed. Additionally, it was not only a decrease in the number of whales witnessed this season, but also a change in their behavior, with the large majority of whale observations involving whales that displayed evasive behavior with long dives and little surface activity. Additionally, very few whales were found to be singing. Worried about the situation, ECOBAC contacted whale researchers and tour operators from other regions across the North Pacific, and all told of the same situation of a much smaller quantity of whales. 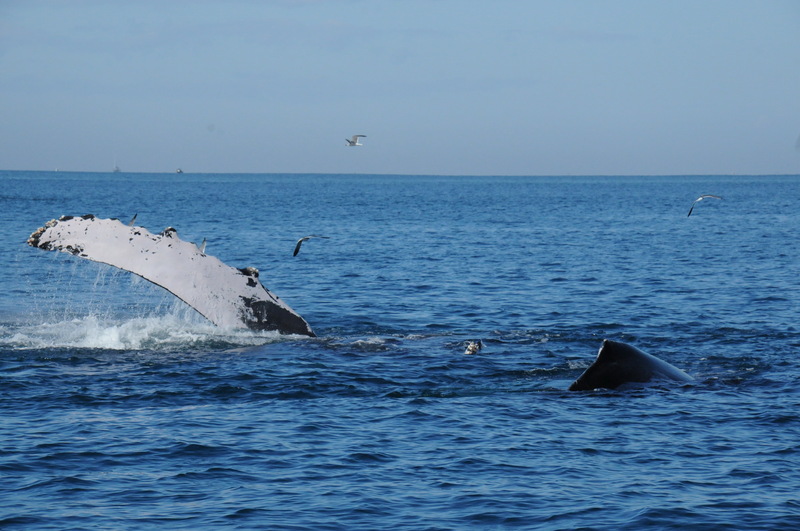 It was therefore proposed necessary that a complete analysis of whale abundance at the ocean basin level be performed to try and understand the implications and causes of this change to the migration of humpback whales, and to find out exactly where they were this season. As you already know, in RABEN we have 15 inter-agency teams distributed along the Mexican Pacific, trained to safely rescue whales that are entangled in fishing gear. This year, despite the few whales recorded, RABEN still attended to nine reports of entangled whales throughout Mexican waters. For the network to function well it is essential that the local community know of RABEN’s work and that they are informed of what to do in case they encounter an entangled whale. The collaboration of local fisherman and tour operators is vital for fast response to reports of entangled whales. Without this communication to RABEN teams, whales may remain entangled for a greater period which may even result in the death of a whale. We know that not every disentanglement will be successful due to reasons out of our control, such as weather conditions, hours of daylight, behavior of the whales etc., but we are proud to now count 180 members of RABEN who have for one more year worked excellently in attending to entangled whales and spreading news of the work of the disentanglement network. We will continue with training and to look to replace the tools that were lost during rescues this year, to be prepared and ready for the next whale season. 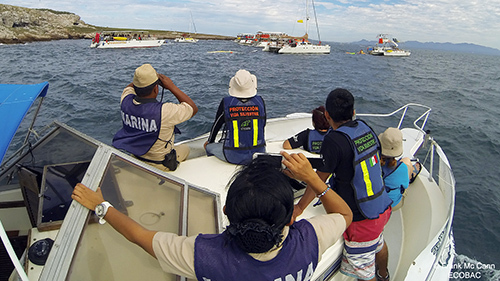 Even though there were fewer whales recorded in the area this year, ECOBAC still conducted a census and vigilance of whale watch activities in the Bay of Banderas. In total, 13 vigilance trips were made in which they managed to observe 42 different occasions where vessels were engaged in whale watch activities. 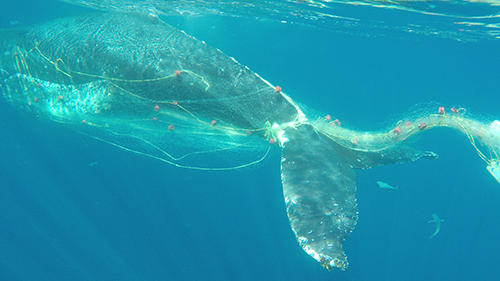 This is almost 60 % less than what was recorded in the last whale season. Most of the whale watching activities occurred close to the Marietas Islands National Park or slightly outside of the bay, and for that reason very few boats inside the bay reported that they were involved in whale watching this year. In fact, some whale watch operators decided to finish their whale watching tours and to close for the season almost a month earlier than the official end of the season. This was mainly due to the long journeys necessary to find whales (often to outside of the bay), combined with the few whales present and the fact that additionally the ocean conditions this season were not optimal for whale watch activities. This all contributed to whale watching being very difficult in the Bay of Banderas this season, which sometimes led to the tourists not being satisfied with the trips. It is clear therefore, that the reduced whale abundance in the Bay of Banderas will also have had an impact on the economy of the region. On the 30th of January 2016, a humpback whale mother and calf pod were found travelling at the entrance of the harbor of Puerto Vallarta. This represented a serious risk for both vessels and for the whales, as it is an area of high marine traffic. For this reason, we undertook the task of trying to protect the mother and calf staying with them for several hours in a vessel. 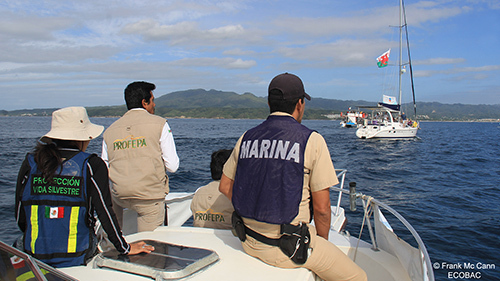 With the support of the Harbor Master of Puerto Vallarta we also issued a warning via radio to the vessels entering and leaving the harbor to take precautions to avoid the whales. Thanks to this work there were no accidents that day. Unfortunately, there was also a report of a tourist vessel that allowed their clients to get into the water to swim with a mother and calf pod, which apart from being very dangerous, is prohibited by the Mexican whale watching regulations. This act, which was irresponsibly allowed by the vessel crew, could have triggered a serious accident. This act was reported to PROFEPA Delegación Nayarit, and the report is still being processed. This season we have implemented a new part of this program, giving ourselves the task to record the number of vessels, types of maneuvers and speed of travel between Punta de Mita and the Marietas Islands National Park, in the zone known as “el canal” or in English “the channel”. The international fame of the Marietas Park has generated a noticeable increase in marine traffic in the channel, which is also used as the principal entrance of the bay by humpback whales. Our results show that during the holiday periods or on bank holiday weekends on average one boat per minute will pass through the channel, and outside of holiday periods 0.3 boats a minute will pass through the area. We estimate the average travel speed is 30 miles per hour, which would make it impossible to avoid a whale and in the incident of a collision this speed might be deathly for both the whale and people aboard the vessel. Additionally, faster speeds will also generate greater noise, which might lead to whales avoiding entering the bay. 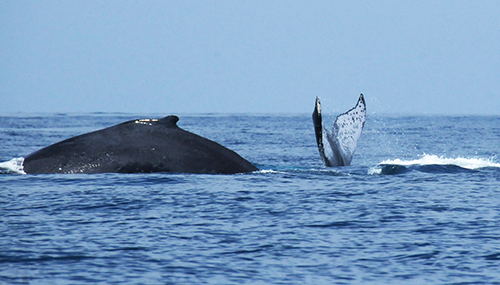 We are planning a meeting before the next whale watching season between the authorities and the tour operators of Punta de Mita, where this data will be presented to propose actions to be put in place to prevent accidents in the future. Following our observations in the field, we suggest it´s important to reduce speed while navigating through the channel area and to have an observer standing at the bow of the boat checking the horizon for whales. Both actions will reduce dramatically the risk of vessel collisions with whales. The successful running of this program is only made possible by the sponsorship of the “United States Fish and Wildlife Service”, the support of the Opequimar Centro Marino, and the 8th Navy Zone, whom just like our volunteers, year upon year join and support our campaign. We are grateful also to Ana Ezcurra, Artemio Martínez, Candy Lara, Fabiola Flores, Jorge Morales and Monse Servín who joined us on the vigilance trips. As part of the campaign “I care for the whales” and with the moto “Knowing, loving and caring”, the 2nd Festival of Whale Conservation was held. It was aimed this year principally at the younger local population. We started with talks and presentations in schools and public libraries of the region as preparatory activities for the festival. This begun on the 16th March in the library of Los Mangos in Puerto Vallarta, where children of the city arrived at 5pm to learn and have fun. 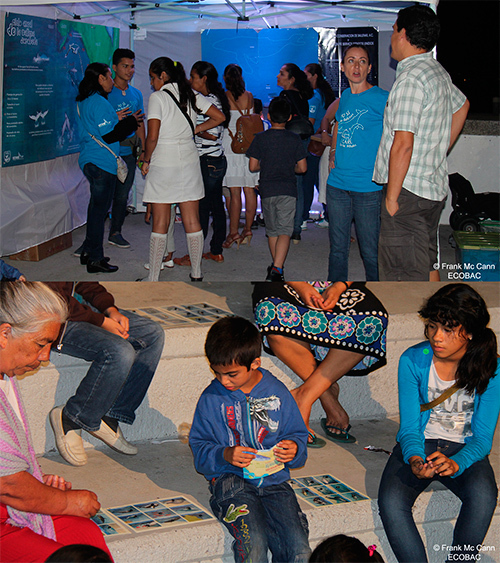 Then at the Centro Univeritario de la Costa the biologist Astrid Frisch presented a lecture about humpback whales and whale research projects in this area. The festival then ended on a high note with a display on the arches of the Vallarta boardwalk with games, interactive segments and education panels that were there to draw attention of locals and tourists that walked by. 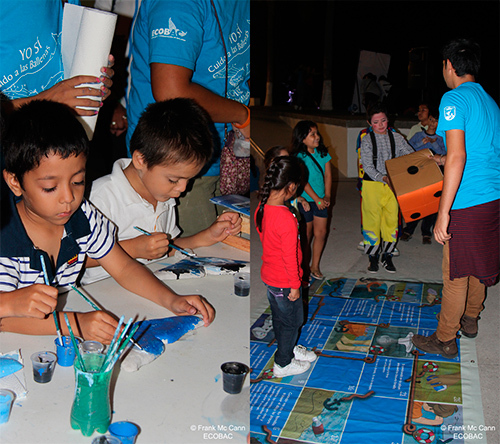 Also there was a game that the children could play called “Zooomergidos” that helped them to lean about the marine mammals of the Sea of Cortez, the anatomy of whales and some of the threats that they face. It was also the the premier of the kids story “Yuba and the ball” wrote by Biol. Roberto Moncada (Instituto Tecnológico de Bahía de Banderas) and it was a great success. We also presented education panels that enabled the children to learn about whale migration and the anatomy of the humpback whale. “Kuikani” the 6.5 m inflatable whale was the mascot of the event and a great attraction. The 2º. 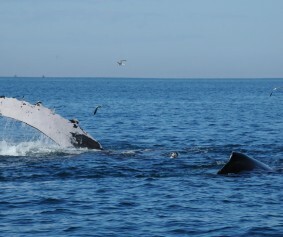 Festival of Whale Conservation was made possible due to the sponsorship of the “United States Fish and Wildlife Service”. The teaching materials were designed with the help of de Ana Ezcurra and the coordination of the Carrera de Diseño para Comunicación Gráfica del Centro Universitario de la Costa, UdeG, led by Marcela De Niz Villaseñor and the students Alma Bernal Navarro, Ángel Vázquez Juárez, César Galindo Hernández, Cindia Pérez Aguirre, Desiree Soto Ruiz, Edgar Orlando Gamboa Ramos, Karla Santana Ornelas, Michelle Medellín Valdez, Ramón Orlando Gamboa Cuadros. 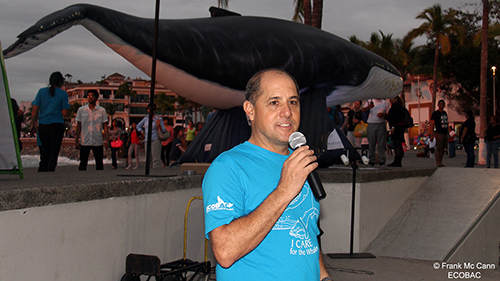 We would also like to thank Tonatiuh Santos García, for his invaluable work in the coordination of the design of the teaching games, of the education panels and of the campaign “I care for the whales”. Thanks also to Valeria Mas for allowing us to use her incredible photograph of a female humpback whale and calf. Also we are very grateful to have had such enthusiastic volunteers who very kindly committed to help in the activities before and during the festival. We are very thankful too Ana Ezcurra, Anel Acosta, Artemio Martínez, Betty Richter, Blanca Eng, Candy Lara, Claudia Parra, David Parra, Edna Cornejo, Fabiola Flores, Franck McCann, Giovana Reyes Haritz Andrade, Isabel Moran, Jorge Morales, Lesli Mendoza, Manyi de la Cruz, Michael Acosta, Mónica Domínguez, Noriela Andrade, Tania Verdín and all of the students of the Instituto Tecnológico de Bahía de Banderas who also joined us to help during the festival. We are going to present our research findings! With the aim of presenting our findings from whale research from this area, ECOBAC submitted two abstracts, that were accepted and will be presented as an oral presentation and as a poster at the XXXV Reunión de la Sociedad Mexicana de Mastozoología Marina, which will be held on the 1st to the 5th of May in La Paz, BCS. The works that will be presented are “The humpback whale (Megaptera novaeangliae) in the Bay of Banderas, México: Analysis of the relative abundance and temporal variation during the winters from 2004 – 2014” and “Photo-identification of the humpback whale (Megaptera novaeangliae): Is it true that lateral fluke coloration does not change over time?” Both pieces of work are important in understanding the status of the population of humpback whales that visit the Bay of Banderas each year, and also reflect all the years of work of ECOBAC.